"Rhonda Jean Levensaler, Westbrook College, Class of 1978"
Westbrook College student Rhonda Jean Levensaler, Class of 1978, was a Fashion Merchandising major and lived in Linnell Hall. 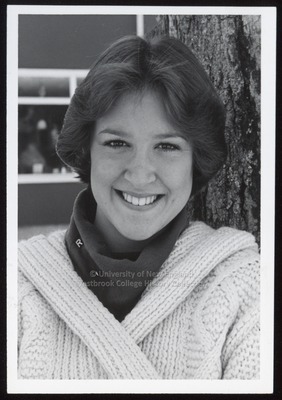 For her senior class candid photo, which appeared in the 1978 Tower Yearbook, she wore a white/off white cable knit sweater over a dark turtle neck jersey. A stick pin with the letter "R" adorns her jersey. Her hair was feather cut, brushed back on the sides, and parted in the middle. Rhonda stands in front of a tree near her residence hall, Linnell.